This is Broadbeach accommodation right on the beach. 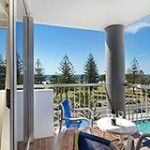 The Sandpiper Beachfront Apartments offer solid 3 star accommodation in one of the handiest locations on the Gold Coast. This holiday resort is perfect for couples and small families looking for a one stop location on the Gold Coast. Escape the crowds at Surfers Paradise when you stay here. You will always know you are just a few minutes away from the energy and excitement of Surfers Paradise. Our fully self contained one and two bedroom holiday apartments at Broadbeach have everything you need for a relaxing holiday on the Gold Coast. The spacious living and dining areas and private front balconies really set the scene for a chilled holiday by the sea. Longer stays are made easier with full laundry facilities in each apartment. Along with the beach in this part of the Gold Coast are some wonderful park lands that form a greenbelt on the way to the beach. These parks are a wonderful amenity to locals and visitors to the Gold Coast. Lined with towering Norfolk Pine trees and dotted with plenty of public facilities like changing blocks, BBQs, playgrounds and covered picnic tables, you’ll find these parks provide an extra dimension to your holiday that is free. You’ll also be happy to know that the Kurrawa Park directly in front of the Sandpiper Beachfront Apartments is also home to the Kurrawa Surf Club. The beach in front of the apartments is surf patrolled 365 days a year. As long as you and your family swim between the flags, your safety is assured. The Kurrawa Surf Club also has a delightful restaurant and bar with a balcony that overlooks the Pacific Ocean. It’s just the perfect way to relax after a day at the theme parks or giving your credit card a workout shopping at the malls. Or relax by the pool, or in the accompanying spa. 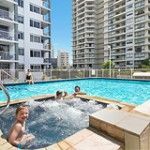 For Broadbeach accommodation right on the beach, the Sandpiper Beachfront Apartments offer solid 3 star accommodation in one of the handiest locations on the Gold Coast. The choice is easy. 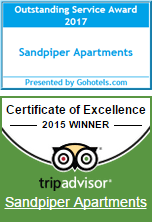 Book now, you’ll love it here at the Sandpiper Beachfront Apartments.